Do you know if you really are a sales leader? 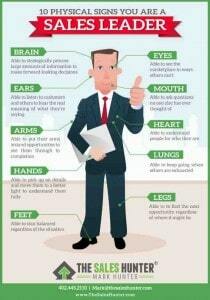 I’ve put together a great infographic that gives you 10 Physical Signs that you are indeed a sales leader! This fun and accurate graphic will spur your thinking and inspire you to strengthen any skills you feel you might be missing.